Photo credit: Leslie Harvey / Frequent Flyer Traveling Mom. The flagship hotel at Disneyland in Anaheim, California is Disney’s Grand Californian Hotel and Spa. With a private entrance into Disney California Adventure park, highly-rated restaurants, and a full-service spa, it is the most luxurious of Disneyland lodging options. 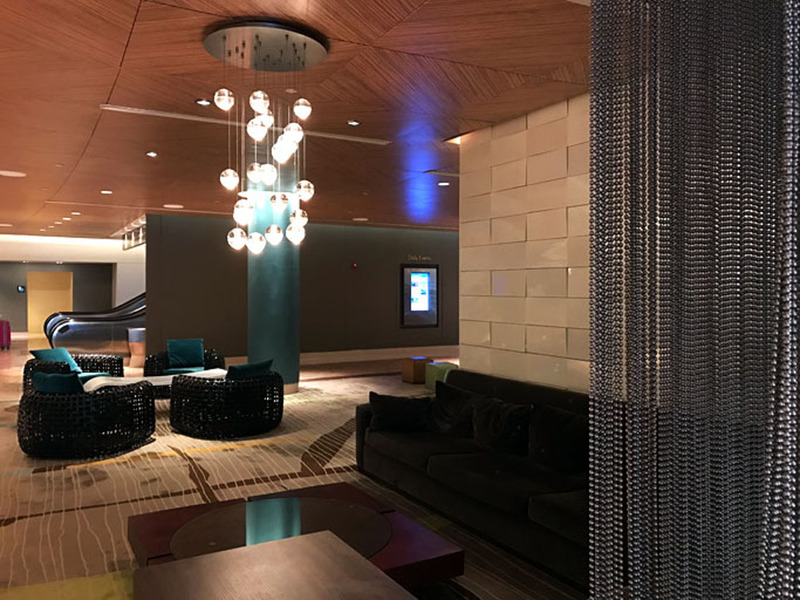 Find out all about the hotel’s best features and get tips for your stay. Plus, learn what works for family travelers (and what doesn’t) in this comprehensive and updated review of Disney’s Grand Californian. Arts and crafts style outdoor view of Disney’s Grand Californian. Photo credit: Leslie Harvey / Frequent Flyer Traveling Mom. Tucked between Disneyland’s California Adventure park and Downtown Disney in Anaheim is Disney’s Grand Californian Hotel and Spa. The Grand Californian is the most luxurious hotel near Disneyland, but it is a luxury hotel built with families in mind. For the most part, Disney’s Grand Californian delivers a premium hotel experience in a Disneyland location that can’t be topped. Service is impeccable with the friendliness that only Disney can deliver. I’ve stayed in the Grand Californian on several occasions during several different seasons, including during the holidays and also several times since the most recent rounds of renovations were completed in 2017. With its luxury reputation and excellent location, however, comes premium pricing. While standard rooms at the Grand Californian can occasionally be found as low as $350-400 in the off-season with major sales, holiday weekend and summer rates can sometimes soar to double or triple that price. For the premium price, there has sometimes been a little room for improvement at the Grand Californian. When my family first stayed at the Grand in 2015, we thought that the hotel was starting to show a bit of age, particularly when compared to our recent experience at Disney’s Aulani in Hawaii the same year. Fortunately, Disney took notice and started a major renovation to all guest rooms and to a number of common areas in 2017. The upgrades have taken the hotel up a level in luxury which helps to justify the very expensive price tag. That said, guests should be aware that they are still paying a premium for the Disney name and location above and beyond what the service and amenities probably justify. Outdoor entrance to Disney’s Grand Californian. Photo credit: Leslie Harvey / Frequent Flyer Traveling Mom. Standard rooms large enough for families of four and five. Top-notch service staff that welcomes (not just tolerates) kids. Refrigerators in every room (essential for babies and toddlers needing milk or formula). Proximity to the parks and Downtown Disney. A decent success rate with an early check-in. Every time I’ve arrived early to the hotel during my last four stays, the hotel has been able to find a room for me several hours before official check-in time. The hotel’s large size (1000+ rooms) can mean long walks for little ones from the lobby, pool, and other central areas to the rooms. Insufficient drawer space to unpack clothes for a family staying more than a few nights. Occasionally long early morning lines to enter California Adventure through the hotel’s private entrance. 11 am checkout time; late checkout hard to come by (non-Disney hotels we’ve stayed in have had noon checkout times and regularly have provided late checkouts). Showers instead of tubs in many rooms unless special requests are made. The Grand Californian features a private entrance into California Adventure park, three pools, on-site character dining, a highly-rated fine dining restaurant, gym, and spa. Anything and everything families could want in a large luxury hotel is available. The hotel is designed in the California craftsman grand style. Fans of the Wilderness Lodge in Walt Disney World or the Majestic Yosemite Hotel (formerly the Ahwahnee Hotel) in Yosemite National Park will feel right at home. The lobby is particularly breathtaking, especially when decorated for the holidays. The hotel lobby features a kids seating area with a television showing Disney cartoons. It’s the perfect solution to entertain travel weary little ones while parents check in at the front desk. The lobby also has a well-stocked gift shop and convenience store, which we found ideal for grabbing milk when my son was a younger toddler. But what most family travelers really will value most about Disney’s Grand Californian is proximity to the parks. The Grand Californian has the best location of any hotel in Anaheim, whether Disney-owned or off-property. The hotel’s private entrance to California Adventure park is a major selling point and usually provides guests with a serious beat-the-crowds advantage. The ability to leave your hotel room with your children and be in line for a ride like Soarin’ or Ariel’s Undersea Adventure 5 minutes later is amazing. The location is also ideal for hopping back for a mid-afternoon nap or to grab an item that you may have forgotten in your hotel room. Private entrance into Disney California Adventure. Photo credit: Leslie Harvey / Frequent Flyer Traveling Mom. Unfortunately, on one of our stays the last few years, the private entrance failed us. This doesn’t happen often, but it’s something that guests need to be aware of at peak times. We visited during a busy holiday weekend when the hotel was full. We queued at the entrance about 20 minutes in advance of the early entry “Extra Magic Hour” into California Adventure. Crowds caused our delay through security and ticket checks, and we were not admitted to the park until more than 10 minutes after rope drop. This meant that guests from the other two Disney hotels entering through the front of DCA actually beat us into the park and into the lines for the most popular attractions. Lesson learned – plan for lines at busy times and queue early, especially during Extra Magic Hour and at park opening. Two queen room at Disney’s Grand Californian. Photo credit: Leslie Harvey / Frequent Flyer Traveling Mom. All of the Grand Californian’s rooms were completely redone in 2017. The renovation has made them lighter and brighter and ultimately more functional for family travelers. Disney Grand Californian Room Desk and Dresser Photo credit: Leslie Harvey / Frequent Flyer Traveling Mom. Standard rooms have either two queen beds or a king. Some rooms also have a special couch that converts into an extra bed to sleep a fifth person. This bed isn’t quite as big as a regular twin bed, but it’s large enough to sleep children. The hotel used to have bunk beds in many rooms, but those were eliminated in the renovation. Special trundle sofa bed to sleep a fifth. Photo credit: Leslie Harvey / Frequent Flyer Traveling Mom. Rooms also all have a refrigerator, single cup-Keurig coffee-maker, robes and slippers in the room closet, hairdryer, desk area, and flat-screen television. The hotel added ample USB ports and outlets in the renovation, so there’s no need to search for a place to charge your phone. The bathroom has double vanities and enough counter space for multiple people. The only negative for families is that the vanity area is open to the room. There is no sliding door or other barriers to block light and sound. If you have a baby or toddler with an earlier bedtime, the lack of separation can be a drag. Bathroom view at Disney’s Grand Californian. Photo credit: Leslie Harvey / Frequent Flyer Traveling Mom. The toilet and shower area are, however, in a separate room. Families should know that post-renovation, most rooms now have showers. Some tub rooms are available, so if you have a little one who needs a tub for bathing, be sure to make a special request. Foodies visiting the Grand Californian have plenty of options. The hotel’s main restaurant, Napa Rose, is consistently one of the top-rated restaurants in the Anaheim area. While kids are welcome, it is a place that most adults would probably rather visit for a quiet date night. The other large restaurant, Storytellers Cafe, features character dining at breakfast (and on weekends for brunch) and is also open for lunch and dinner. A new character meal, Mickey’s Tales of Adventure, opened there in the summer of 2018. Hosted by Mickey himself in his adventurer’s gear, characters get the kids out of their seats for a mini-parade every half hour. Other characters often at this meal include Minnie, Chip & Dale, and Pluto. The previous character meal offering, Chip & Dale’s Critter Breakfast, was often criticized for its slightly too obscure character lineup. This new meal is a definite improvement for young kids. Mickey’s Tales of Adventure Character Meal. Photo credit: Leslie Harvey / Frequent Flyer Traveling Mom. The Grand Californian also has a small quick service restaurant, White Water Snacks, for grab-and-go food. Double check the hours before visiting as we found once that the restaurant did not open in time for us to grab breakfast before park opening when California Adventure had a 7:00 a.m. Extra Magic Hour opening. Food and beverages are also available at Hearthstone Lounge right off the hotel’s majestic lobby. When it comes to the overall hotel experience at Disney’s Grand Californian, guests may be of two minds. Disney has clearly made a concerted effort to style the hotel in an understated and elegant way. Many adults who feel need to escape from the overwhelming Disney lights and characters after a day in the parks will really appreciate the more luxurious touches. On the other hand, more enthusiastic Disney fans could find the lack of Disney theming a bit disappointing. The lobby is certainly awe-inspiring, but Disney theming is harder to spot. The pool areas seemed somewhat spartan in comparison, for example, to the pool at the Disneyland Hotel that features a monorail waterslide. The Grand Californian’s redwood tree slide hasn’t quite impressed my kids, ages 9 and 5, to the same degree. Disney’s Grand Californian’s redwood tree waterslide and pool. Photo credit: Leslie Harvey / Frequent Flyer Traveling Mom. The new room design, fortunately, increases the Disney presence a bit. While the old room design had only subtle character images on the bathroom shower curtain, the new rooms feature Chip and Dale on the room wall. It’s not overwhelmingly themed or overdone, but it feels more Disney. My kids noticed and commented immediately. Even with these very few caveats, the Grand Californian simply has no hotel rival in the area. There is a good reason many families would never consider staying elsewhere. And its excellent location may simply trump every other consideration. Previous Post: « 9 Fun Things to Do in Austin – BBQ, Music and More!